The CLASSIC 10 boast an array of new design characteristics that for the first time have been consistently featured in an AUDIO PHYSIC series with such attractive price points. The professed aim was to exclude any influence of the cabinet on signal reproduction to the greatest extent possible. If the cabinet is prone to natural oscillations, even the best chassis become impaired in their performance. Partially rounded and at the same time tilted loudspeaker cabinets, as in the REFERENCE and HIGH-END lines, eliminate any possibility of the cabinet's developing its own acoustics, yet they are extremely elaborate to produce. Now our development department has managed to take many of the virtues of the large and world-renowned AUDIO PHYSIC models and apply them to a new series. The cabinets of the CLASSIC loudspeakers are a fundamentally new development and one of a kind. The body consists of three layers with various dampening characteristics and different levels of stiffness. The result, a sandwich cabinet, has a thickness of 20 millimetres and possesses acoustic characteristics of significantly greater design diameters. A major advantage of the three-layer wall is the dramatic reduction in sound permeability, especially in medium frequencies. For the stiffness of the cabinet is not the sole factor that is acoustically relevant; also how much inwardly-emitted sound escapes outside through the walls. A heterogeneous sandwich is significantly more successful at dampening this sound than a uniformly dense material, and at the same time it is effective in eliminating partial vibrations. All in all, these AUDIO PHYSIC new designs achieve a minimum of resonance and thus a minimum of intrinsic sound previously considered unattainable in this price range. Ideal conditions for the also newly developed chassis of the CLASSIC 10. The cones for low and medium frequencies are symmetrically arranged around the tweeters. This creates uniform distribution of pressure on the cabinet; best prerequisites for precise sound reproduction, combined with a superb location of instruments and artists. 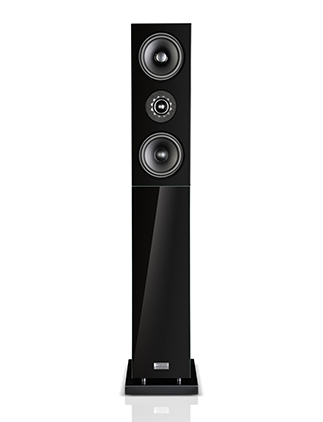 In the bass, the cone chassis work in tandem and create a powerful foundation full of depth. The surround and drive of the chassis allow the suspension system greater linear lift and thus, even in booming surround applications, afford stunning reserves for a high-fidelity performance. The phase plug of the woofer is firmly attached, thus it does not vibrate with the membrane to the beat of the music. An elaborate structural shape, but one which drastically reduces compression effects behind the membrane. Effects that especially in the mid-range would otherwise lead to imprecision in signal fidelity. The design improves the dissipation of heat from the moving system. Heat accumulation would alter the physical parameters of the system, and the consequences can usually be seen in lethargic sound, lacking definition. The actual woofer is located beneath the tweeter dome. It is equipped with a generously-dimensioned drive and a four-layer copper voice coil. This is how we achieve optimal power conversion and an exact displacement of the membrane. The star-shaped acoustic panel around the tweeters facilitates uniform sound dispersion. This allows the high-performance fabric dome to fully develop its capabilities – far beyond the audible range of the human ear. The chassis of the CLASSIC 10 model, with a sturdy front panel, provide visually homogeneous unity. Visible fixtures thus cannot detract from the appealing looks of the loudspeakers. Each CLASSIC 10 is delivered with two different front panels; one version without a cover, offering a view of the chassis, and another front panel covered with fabric. The front panels can be effortlessly swapped out. Those who enjoy music but don’t fancy looking at the chassis can opt for the fabric-covered model without remorse. It is acoustically neutral. With or without fabric covers, the CLASSIC 10 model is always spot-on. The intelligent base design of the CLASSIC 10 is an integral element of the loudspeaker and guarantees a secure footing on any surface. For delicate flooring, we recommend the optional AUDIO PHYSIC Vibration Control Feet VCF II M8 in order to achieve top-quality sound reproduction. They keep micro vibrations securely in check and protect the surfaces. Last not least, the CLASSIC 10 loudspeakers offer as standard WBT nextgen plug connections for banana connectors and sandwich spades for top-quality sound. These high-tech terminals also minimise factors affecting sound due to micro vibrations. Further testimony to the fact that AUDIO PHYSIC loudspeakers are the result of painstaking research and consistent development – true to our motto, “no loss of fine detail”. The CLASSIC models are closer than ever before to the stunning sound capabilities of our HIGH-END line. The 2 ½-way speaker operates similar to a 2-way speaker, but is supplemented by an additional woofer, which covers the frequency range up to 500 Hz in parallel to the mid-woofer.